Synopsis: Nick, a successful college student on paper, seems to have his life all figured out, but he lacks the one thing that intelligence and career don’t offer his life: someone to share it with. After countless failed attempts with online dating, Nick all but gives up on his search when a secret admirer reaches out to him. 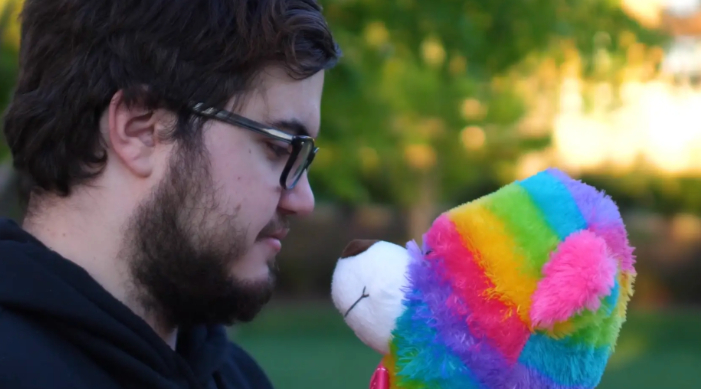 His excitement soon dissipates to depression when a promising date is revealed to be a catfish attempt by a non-speaking teddy bear named Daniell. Following some time apart, Nick runs into Daniell, and in a last ditch effort publicly professes his love for the only person that’s ever cared for him. BL: The two primary sources of inspiration were the current internet dating landscape and how people invest so much in traditional romantic comedies. Dating apps is something that I have yet to take part in so I wanted to comment on how I perceived them at the time which is a very surface-level, shallow way to judge a stranger. I liked the idea of playing with how rejection in that medium sort of heightens how alone someone can feel behind a screen while contrasting it with the classic storybook matches that are common in romantic comedies. I think the two go pretty hand-in-hand in that they’re clientele and audience are driven by some element of loneliness. And then, most of all, I wanted to make people laugh which explains some of the more obscure parts of the story. BL: I was about halfway through my junior year in college which was sort of the height of Tinder’s popularity, at least on our campus. I knew I wanted to produce something that Spring and I was caught up on this skit idea of someone getting catfished by an inanimate object. So I melted the two together, my feelings on the landscape and the skit idea, and once I did that it took off pretty quick. I was also able to write the characters tailored to friends of mine who were actors who I knew were available which was also a huge help throughout the entire process. BL: Keeping the story contained. It’s easy to want to expand your story too far where it no longer fits around 10-15 min which was my target length. I have a background in stand-up comedy so I speak about film the same way I do jokes in that they need to be tight. When you’re trying to fill a certain amount of time you need to be ruthless in cutting shots, details or scenes to make your product as economical as possible. BL: I was a first-time filmmaker for Swipe Right and my DP, Patrick Brown, was shooting his first short-film as well, so there was a lot of learning as we went. Looking back, though, I wouldn’t have wanted to produce this any other way. BL: Go do it and do it with people you like. It’s much easier said that done, but you can’t get better if you don’t let yourself fail in the first place. Swipe Right had plenty of hiccups but they were easily overcome because our cast and crew were extremely supportive. That comes from being passionate and having fun with the people you collaborate with.